This training is FREE! Use Coupon Code CSATRTO to access this training free of charge. DescriptionWhat is CSAT?What are Freedom Stickers? Use Coupon Code CSATRTO to access this training free of charge. Community Heroes: C-stores Stop Human Trafficking training was designed to help employees recognize the signs of human trafficking and proper response protocol to follow if it is suspected. The goal is to encourage employees to "trust their gut" and make the call that could save a life. Click here for a preview of the Community Heroes training. In addition, don't forget to order Freedom Stickers for your store(s) today! 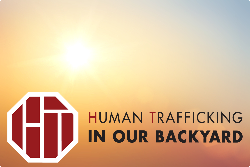 Convenience Stores Against Trafficking (CSAT), a program of national nonprofit, IN OUR BACKYARD, empowers the convenience store industry to play a vital role in stopping human trafficking in local communities with a no-cost, easy to implement program. CSAT raises public awareness, safely reaches out to victims, and trains convenience store employees to recognize and report trafficking. Order Freedom Stickers for your store(s) today! CSAT reaches out to victims through Freedom Stickers, which contain a message of hope and the National Human Trafficking hotline - a non-governmental agency with local networks of victim-centered responders. CSAT posts Freedom Stickers in convenience store restrooms because that is the safest place for a victim of human trafficking to call or text the hotline and arrange a safety plan and connect to services.